At the start of the day we knew the elite eight had the potential to deliver a fantastic final table and what a final table it was. There was the guy who didn't plan on playing the event in the first place (Oliver Price), there were the guys who satellited in for just a few euros (Muratov and De Benedittis) and there was the guy who had already finished runner-up in an EPT (Sotirios Koutoupas). And then there was the main story: Eugene Katchalov, who was chasing the Triple Crown. After winning his World Poker Tour title back in 2007 for $2,482,605, and his WSOP bracelet, a 7-card Stud tournament in 2011 for $122,909, it was now time for that coveted EPT title. He was close in 2011 when he finished third at EPT Barcelona, would he complete the most illustrious title here? The tournament started out rather quiet. The first couple of hands went raise and take it, there were no flops in the first two orbits. Things would change soon enough though. The first player to bust was Anthony Lerust. Sotirios Koutoupas opened to 105,000 from under the gun plus one with . Action quickly folded to Anthony Lerust in the small blind he pushed for 1,005,000 with and the big blind folded. Koutoupas made the call and the last Frenchman was at risk. The on the flop brought Koutoupas four direct outs. The on the turn gave the Greek player even more outs. The on the river was one of the cards the man from Greece needed and a disappointed Lerust shook hands with all the players at the table and made his way to the exit. 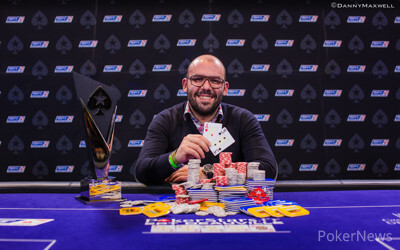 It would only be the first of two times that Koutoupas would crack aces, and it would become the first of two back to back eliminations as Carlo De Benedittis was eliminated the next hand. From under-the-gun plus one Oliver Price opened to 100,000 with , Carlo De Benedittis shoved for 365,000 with and Price made the call. The flop meant that neither player wanted to hit their kicker now. The turn and river kept Price in front and we lost Carlo De Benedittis in seventh. Rustem Muratov would be all but felted not much later. Eli Heath opened the cutoff to 100,000 holding . Behind him sat the last qualifier Rustem Muratov with and he shoved all in for a little over 1.5 million. Muratov wouldn't find his foe in Heath though, Oliver Price was behind him holding and called all in. After Heath folded, the board didn't improve anyone. Muratov was left with just 10,000, two antes at the time. Muratov would first quadruple up with pocket kings against Harry Law's . The next hand he moved all-in for 40,000 with . Oliver Price isolated from the button with and got calls from Harry Law with and Eugene Katchalov with . This hand would be an important one. Not only since the tournament would eventually lose the amicable Muratov, more so as Katchalov was going to lose a big portion of his stack. On the flop Price bet 125,000 and Katchalov was the only caller. The turn improved Price to trips but both players checked and the hit the river. Katchalov checked to Price who bet 320,000. Guest commentator Jon Spinks thought that Price's bet was too big to get paid off but Katchalov did call and saw the bad news. Muratov gone in sixth, whilst Katchalov was now the shortest stack of the five remaining players. Katchalov doubled however and managed to turn things around. Law opened the small blind to 180,000 with . "Ow, this can get messy" said co commentator Marc Convey as the graphics revealed Eugene Katchalov had in the big blind. Katchalov made it 450,000 and action was back on Law. He announced all in, Katchalov double checked his cards and called. Law frowned on getting such a quick call. He might have expected to be dominated and probably was ok seeing he had a coinflip situation. The flop was no harm for Katchalov. Law had some backdoor outs but the on the turn ensured he needed to hit an ace or jack to win and eliminate the Triple Crown chasing Katchalov. The on the river was a blank and Katchalov doubled up into second place. The biggest hand of the tournament would happen with five players left. You could hear the oooohs and aaaahs from the tournament room as soon as it happened. Law opened under the gun to 160,000 with . Sotirios Koutoupas in the small blind had a big hand with and surely wasn't folding. You could feel the tension in the air, the commentators of the live stream already foresaw big action. Koutoupas made it 440,000 to go and Oliver Price quickly folded his big blind. Getting a three bet with pocket aces, Christmas came early for Law it seemed. He four bet to 985,000 and action was back on Koutoupas. The Greek shoved all in, Law immediately called. The biggest pot of the tournament with 8,230,000 in chips in the middle. Law's graphic said he was a 87% favorite to win the hand. It said 2% after the flop: . Law now needed runner runner straight flush for a split pot, or runner runner to win it. It wouldn't happen. on the turn and it was all over for Law. The on the river was there just to make it official. 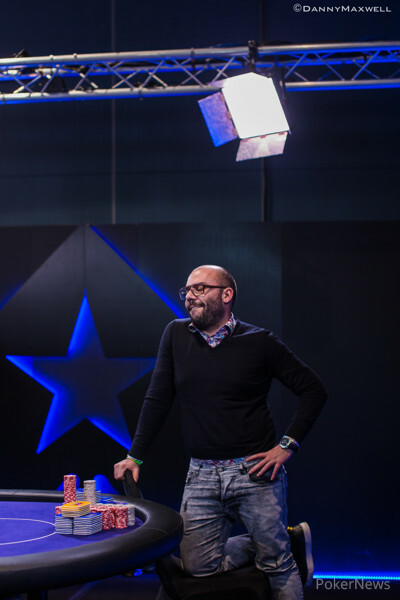 Law exited in 5th place, taking home €164,600 after suffering that horrible beat. 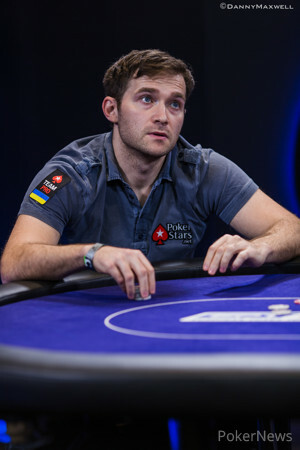 On the next hand Eli Heath was eliminated in fourth place for €207,800. From under-the-gun he moved all-in for 1,230,000 (12 big blinds) with . Next to act Sotirios Koutoupas called with , both blinds folded and it was time to go to showdown. Yet again Heath had got it in good, but again he'd be brutally outflopped as the first three community cards were . Heath now just had an 11% shot to stay in the tournament. He didn't get there on the turn or river and shook the hand of his opponents as he left the table. Oliver Price was about to hit the rail next. Already short he shoved from the big blind with after Sotirios Koutoupas had opened the small blind to 250,000 holding . Snap call by Koutoupas. 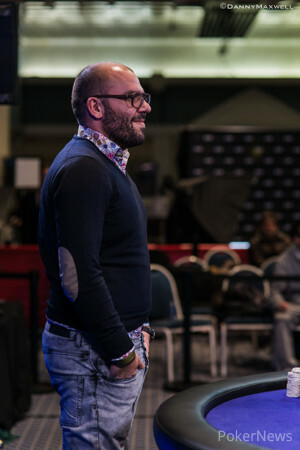 Commentator Joe Stapleton jokingly said that Koutoupas would have this confrontation locked up after the flop, the way he had been running this final table. "Ha!" Stapleton shouted as the window card became visible. The and that accompanied the queen for the flop gave Price something of a chance. Only one out of twenty times Price would still win this certain situation though. "So you're telling me there's a chance?!" The on the turn turned Price's 5% hand into an 18% hand. With an up and down, every ten and five would now give him the much needed double up. All other cards would mean he was out. The river was a and the fairy tale was over for Price. Price, who wasn't planning on playing this event until Dominik Nitsche convinced him, walks away with €271,200 during his second ever EPT. The players went on a small break for the organization to set up the heads up match. Sotirios Koutoupas had 15,050,000 in chips, Eugene Katchalov had just 4,990,000. As the blinds were 50,000/100,000 it was a 150 big blinds versus 50 big blinds match, more than enough room to wiggle around with. Katchalov was close to getting that Triple Crown title but wouldn't get it. The heads up match was only going in one direction; Greece. Koutoupas played well the entire final table and ran well as well. A dangerous combination Katchalov would soon enough know. Koutoupas had the chiplead all day long and Katchalov wouldn't even come close heads up. Katchalov made some failed hero calls but would soon find himself all in with a 70% hand, and lose. Koutoupas opened to 200,000 from the button with and Eugene Katchalov made it 500,000 to go from the big blind with . Katchalov started the hand with 3,605,000 and would soon have to risk all those 36 big blinds as Koutoupas shoved all in. Katchalov didn't have to think twice and called. The flop was a blow for Katchalov. Koutoupas had his hands on his head, he couldn't believe it. He didn't want to celebrate to early, but everyone already knew this wasn't going to go wrong anymore. The on the turn made some people hold their breaths, but the was a blank and Koutoupas his hands went from his head to in the air. The flop was a blow for Katchalov. Koutoupas had his hands on his head, he couldn't believe it. He didn't want to celebrate too early, but everyone already knew this wasn't going to go wrong anymore for him. The on the turn made some people hold their breaths, but the was a blank and Koutoupas' hands went from on his head to in the air. Eugene Katchalov shook hands with the winner, still smiling and soon enough nipping on champagne with his Greek compadre. Sotirios Koutoupas has stretched his chip lead and it's now more commanding than when heads-up play began. He raised with to 200,000 on the button and Eugene Katchalov elected to just call with from the big blind. On the flop Koutoupas continuation bet 200,000 and Katchalov check-called. The turn checked through and the fell on fifth street. Katchalov checked, Koutoupas bet 400,000 and after a long think Katchalov decided to call. He nodded when Koutoupas rolled over pocket jacks and the momentum is with the Greek right now. It was Katchalov's button and he raised to 200,000 with , call from Koutoupas with . The Greek player paired his kicker on the board and the flop went check-check, as did the turn. On the river Koutoupas bet his trip sevens, 250,000 was the price and Katchalov decided to look him up. Pot to Koutoupas. Koutoupas had and opened for 200,000. Katchalov called with . They saw a flop of . A bet of 225,000 from Koutoupas and Katchalov called. They both checked the turn and on a river card Katchalov led out for 350,000. Koutoupas had hit his hand on the river but not strongly enough for him to make the call. Koutoupas raised on the button with and Katchalov defended with . They saw a flop of . Katchalov checked and when Koutoupas bet 200,000 he raised to 400,000 and Koutoupas folded. After a raise to 200,000 from Sotirios Koutoupas with , Eugene Katchalov three-bet to 525,000 and Koutoupas folded. The reason for the three-bet soon became clear as it was revealed that Katchalov had . The Team PokerStars Pro is doing a good job of grinding down Koutoupas and the stacks are now a bit closer.